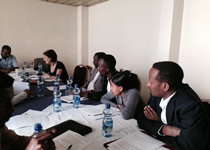 The training was attended by Ethiopian officers from the MoJ and a number of key agencies including: the Ethiopian Revenues and Customs Authority; the Federal Police Commission; the Federal Ethics and Anti-Corruption Commission; the Federal Supreme Court; the National Bank of Ethiopia; and the Amhara, Oromia, and Tigray Regional Justice Bureaus. Following welcoming remarks delivered by Mr. Addisu Mengistu, Assistant Attorney General & Director of the Legal Drafting & Dissemination Directorate of the Ethiopian MoJ, and Mr. Anders Kaldan Helstrand, Peace and Stabilization Programme Officer at the Danish Embassy in Addis Ababa, the training was delivered by CGCC’s team of local and international technical experts in close collaboration with trainers at the Ethiopian MoJ. The training featured both classroom-style lectures and discussion sessions, including interactive role-play scenarios and case studies. The final day of the training included a special ‘train-the-trainers’ segment during which CGCC’s technical experts and the MoJ’s training staff reviewed and reflected on the effectiveness of the approach used during the course of the workshop. This segment also served as an opportunity to review the written materials used in the training and the status of the draft Ethiopian AML/CFT training manual, also being developed in cooperation with CGCC under the Danish government-supported package of assistance.